Masala Dosa is usually prepared in southern part of India. Now a day it has become popular all over the world. The name Masala is used for the specially prepared Dosa, which is stuffed with Red chutney and Potato Sabji. 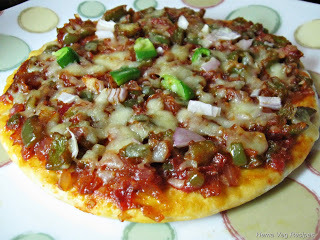 Some people serve Masala Dosa with Sambar also. Now in many restaurants we get variety of dosa stuffed with variety of sabjis and are called with different names like Rava Masala dosa, Vagetable Masala Dosa, Mysore Masala Dosa. 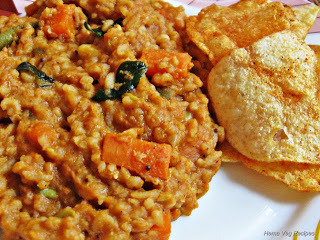 I have already posted normal Urad dal Dosa few months ago. I usually change the ingredients while preparing the Masala Dosa. 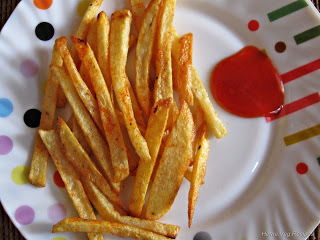 Some people use the same ingredients as of normal Dosa and spread the chutney, Potato sabji on it. But these below listed ingredients give more taste to the Masala Dosa. 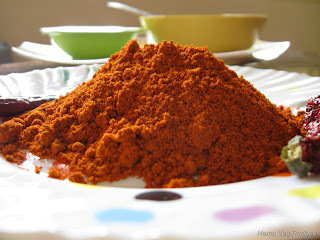 Here in this recipe, I have not explained the red chutney preparation method because this one is my different flavoured Masala Dosa. 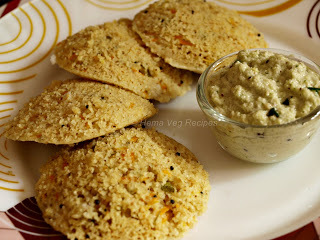 Just check my Potato Sabji and Coconut Chutney post for preparing this Masala Dosa. 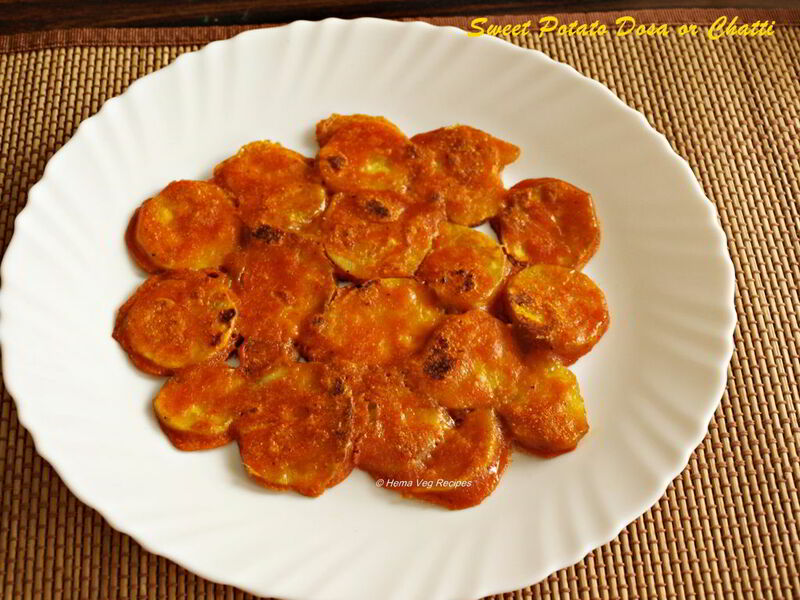 This recipe is adopted from my mother; who is the best cook of our traditional dishes Mangalorian dishes. 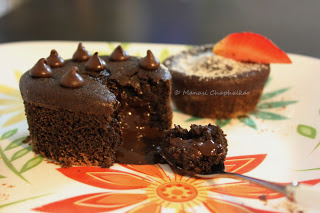 Many of the posts I have uploaded here are her recipes. 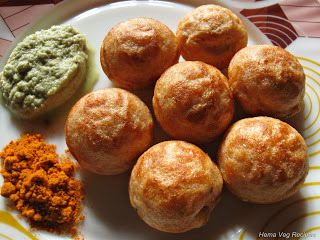 Mainly the Idly-Sambar, Dosa, Laddus, Mangalore Buns, Haalbaai; few sabjis and many more dishes. In this Masala Dosa recipe, soak all the ingredients like dal and rice in the same vessel for about 4 to 5 hours; then grind and keep it for fermenting at least for 8 hours. Once it gets fermented, add the Oil and Sugar before preparing the Dosa. This method gives Dosa its unique colour and crispness. Follow the steps accordingly and enjoy this delicious Masala Dosa. Mix the Rice, Urad Dal, Toor Dal, Channa Dal, Moong Dal and Methi Seeds in a vessel. Wash them thrice with water and soak with clean fresh water for 4 to 5 hours. 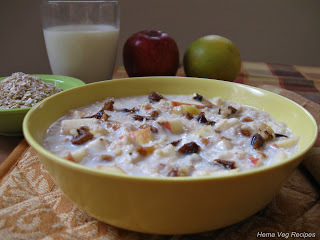 Wash the Thin Poha and keep aside. Grind the soaked dosa ingredients in a mixer or wet grinder for few minutes. 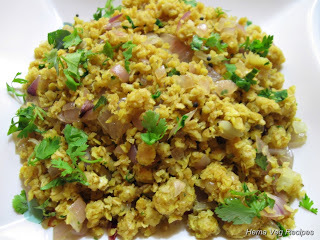 To this you add the washed Thin Poha and grind more for about 5 to 6 minutes. Check the batter for smoothness once, add Salt and sufficient water. 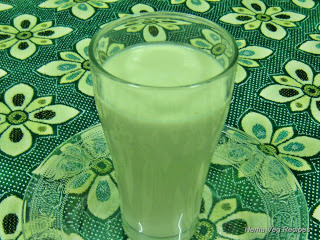 Again grind it to semi liquid form of smooth batter. 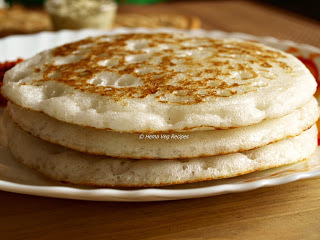 I use wet grinder to grind the Dosa and Idly batter. If you are using the wet grinder, grind the batter for minimum 30 minutes. The Methi Seeds which gives the batter smoothness and increases the volume of the Dosa Batter takes more time to grind in wet grinder. Transfer the Masala Dosa Batter in to a vessel, close the vessel with plate or lid and keep the batter to ferment for at least 8 hours or overnight before you prepare Masala Dosa. 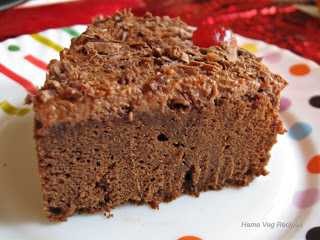 Once the batter is ready, that is after fermentation process, add Sugar and 1 tsp of Oil to the batter and mix well. This gives the dosa golden brown colour. To prepare the Potato Palya or Sabji please follow the instructions in this post and also for the Coconut Chutney please refer this post. 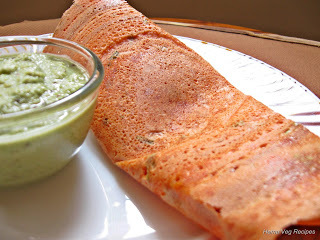 And also check my Dosa post for how to spread Dosa with visual instructions. Heat the Dosa tawa (Iron tawa) also called skillet. Sprinkle some water on the heated tawa, so that water will sizzle and evaporate. This is to know that the tawa heated enough and is ready for preparing the Dosa. Put few drops of Oil on the tawa and rub it with half cut onion piece. The flame should be low. Pour a ladle full of Dosa Batter on the tawa and spread the batter into a circle shape with the help of the ladle. Now increase the flame to medium. Pour 1 tsp of Oil all over the Dosa and leave it to cook for few seconds or till you see the corners of the dosa changing its colour to slight golden brown. (If you want to spread the Red Chutney, spread it at this stage). Now along the diameter of the dosa, spread the Potato Sabji. 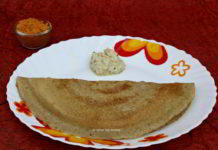 Slowly close the Masala Dosa from sides to a semi circle as shown in the image. Remove the Masala Dosa from the tawa and transfer to a plate. For another dosa, again sprinkle some water and rub the tawa with a clean cloth and repeat the above steps. This helps the tawa to keep the same temperature till end. 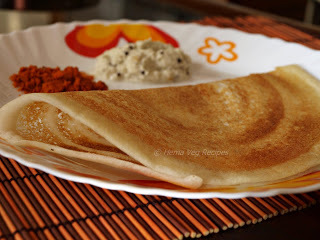 Serve the hot and yummy Masala Dosa with Coconut Chutney.